The Asia Cup 2018 kicked off on Saturday in the United Arab Emirates. 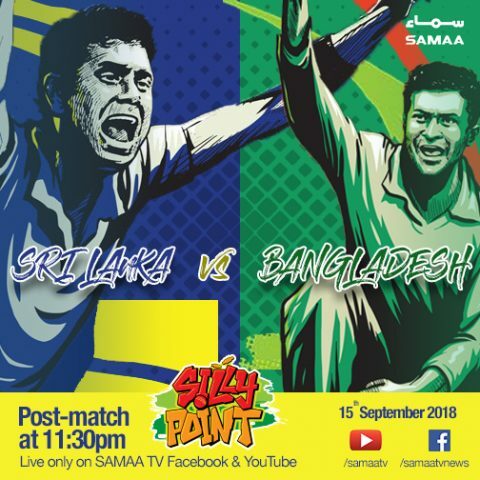 SAMAA Digital is hosting a online TV show Silly Point from 4pm to 4:30pm and from 11pm to 11:30pm. The show features match updates, reviews from previous matches, a discussion on team statistics and the team line, as well as other game-related issues. Earlier scheduled to be played in India, the event was shifted to the UAE due to the tense political relationship between India and Pakistan. Six teams — Pakistan, India, Sri Lanka, Bangladesh, Hong Kong, and Afghanistan — are taking part in the competition. Under two groups, Pakistan falls under the Group A consists of other teams, India, and minnows Hong Kong while Sri Lanka, Bangladesh, and Afghanistan are placed in Group B.
Pakistan will be playing its first match against Hong Kong on September 16. However, the much-anticipated match between India vs. Pakistan from the tournament will be taking place on September 19. The final will be played on September 28. India has been successful in bagging the Asia Cup trophy seven times while Sri Lanka is a five-time champion. While Pakistan got successful twice, in 2000 and 2012, of bringing the trophy to Pakistan.